If you’ve been on the fence in your decision to use or not use pop-ups within your Shopify store, we can’t say we blame you. After all, the Nielsen Norman Group has reported that modal ads —that is, any ad that “appears on top of a site’s content when you go to the site…that must be closed before you can interact with the site content”—are the most despised form of advertising used today. You’re probably wondering why a company that provides a Shopify popup app would tell you that most people hate popups. Now, as we found last October when digging into visitor engagement metrics on Shopify roughly 50% of top Shopify sites utilize some form of popup. With millions of Shopify stores in existence today, it’s safe to say the vast majority of them probably haven’t optimized their approach to using pop-ups effectively. In fact, 76% of the ecommerce stores we analyzed displayed a pop-up as soon as a user landed on their website. Not only that but the majority of stores we analyzed only displayed one type of pop-up. 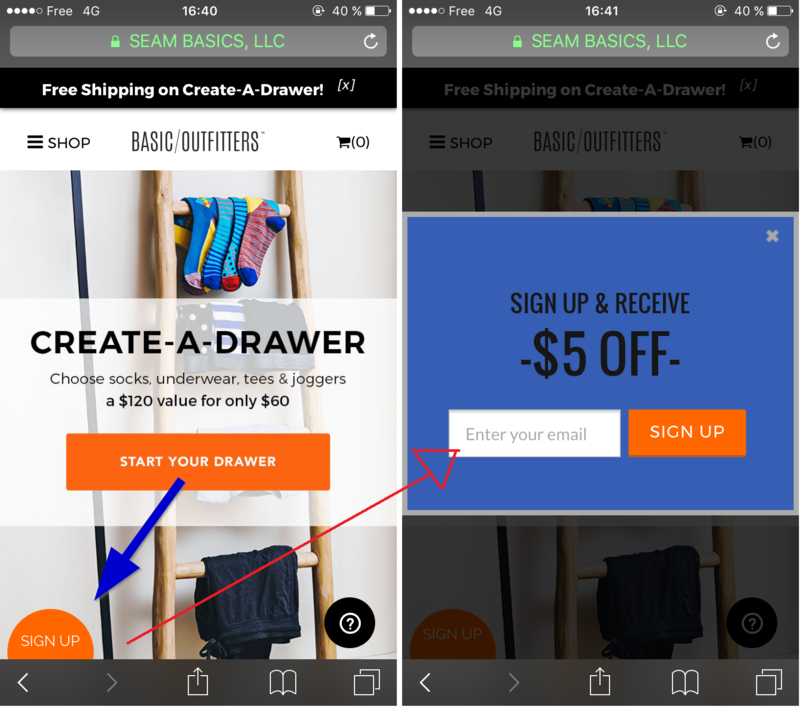 (Both of these are bad practices to creating a smart pop-up that engages users). It’s no wonder, then, that most people say they hate pop-ups more than any other form of advertising; of course they aren’t going to like pop-ups if they’re mainly exposed to poorly-done ones. But this doesn’t mean that all pop-ups are ineffective. 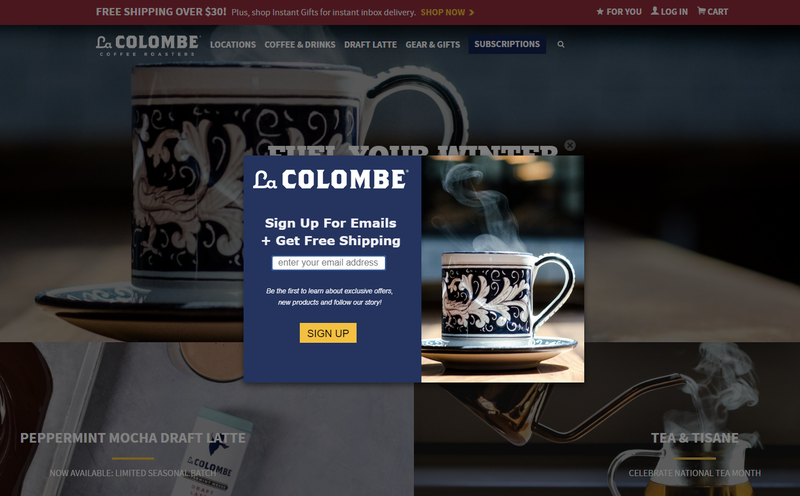 Pop-ups absolutely can be an effective part of your Shopify marketing playbook—as long as you use them strategically. Which is exactly what we’ll be showing you how to do here. 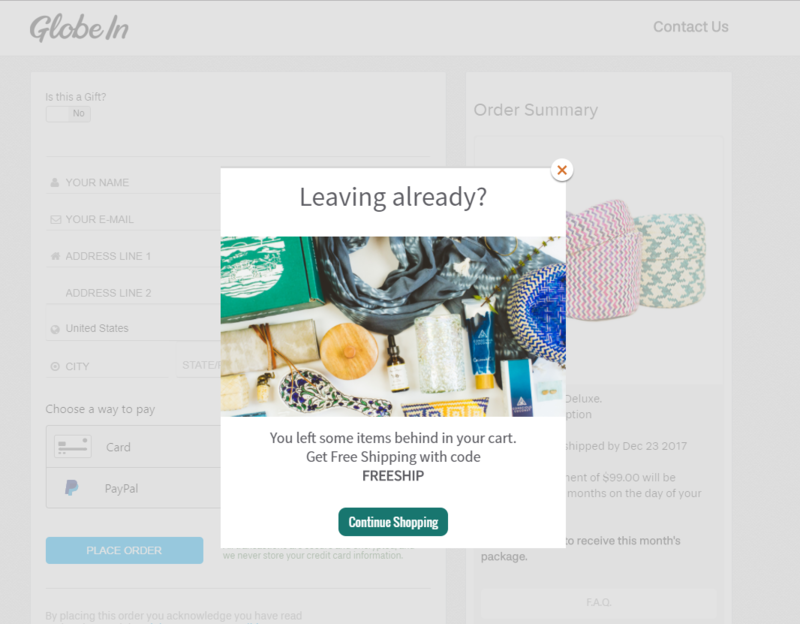 Slide-In Popups: This type of Shopify popup is the least intrusive as it slides into a user’s screen from the side and typically doesn’t obscure a user from viewing your store’s content. As we’ll get to throughout this article, certain popup formats are best used in specific scenarios, for specific purposes. The overall goal for using any form of popup on your Shopify store is to keep your visitors engaged with your brand, and to keep them moving forward in their buyer’s journey in at least some way. Now, let’s take a look at how to make this all happen. There’s no “one way” to go about creating the “perfect” popup. As we just said, you can use popups for a variety of reasons—and you have more than a couple types of them to choose from, as well. Let’s dig a bit deeper into each of these principles, shall we? 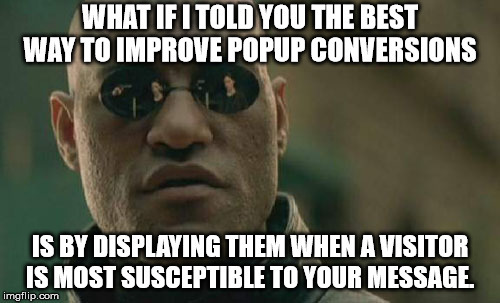 You don’t want to show the same exact pop-up(s) to every single one of your visitors. Rather, you’ll want to create a number of different campaigns targeted at specific individuals within your audience base for a variety of purposes. Essentially, this means developing various segments to target with your pop-ups, then creating pop-ups meant specifically for them. With content segmentation, you’re segmenting your visitors based on the content or products they’ve viewed on your site. This allows you to then display pop-ups promoting said products or supplemental gated content, and other offers that are relevant to the specific consumer’s interests. 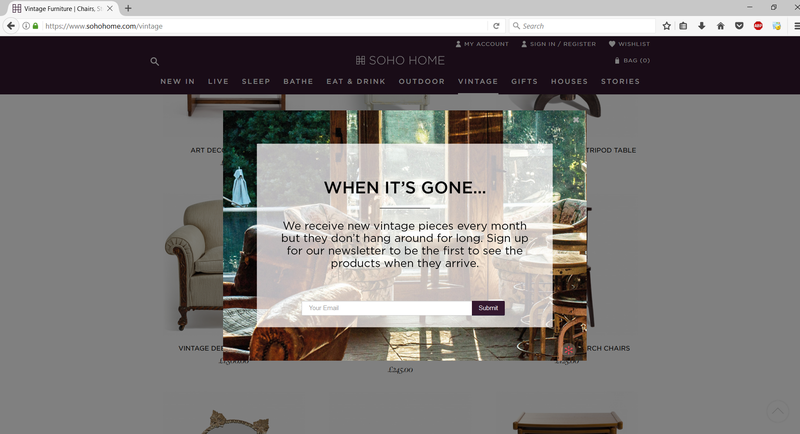 In the example above, the pop-up was designed to target customers with an interest in vintage furniture (hence the copy referring specifically to “vintage pieces”). As we’ll discuss below, the strategic use of copy within your overlay is essential in order to attract the right customers. Not bad, right? Without thinking too deep into things, this is a great pop-up to present to visitors who have never made a purchase from your site before. But, would you say the same thing if, hypothetically, you were a long-time customer of this company, were logged into your account, and still were presented with this message? As a Shopify store, you can refine targeting based on liquid variables, such as cart value, product category, and more. Provide Valuable and Relevant Offers. 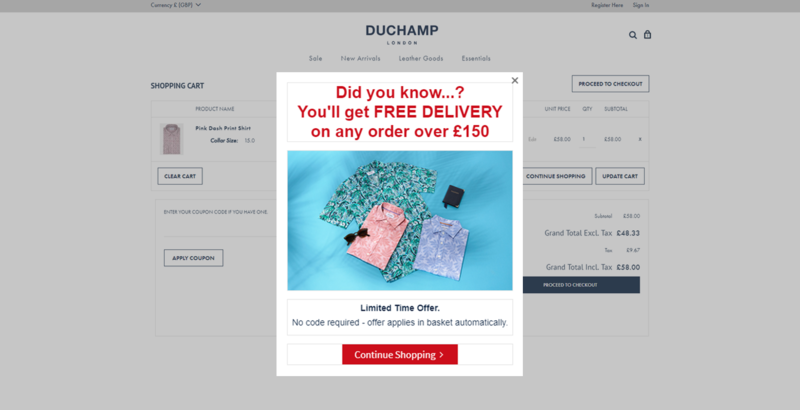 As we discovered when assessing the performance of pop-ups created by our 50 largest ecommerce clients, the inclusion of a relevant offer is often the key to getting your visitors to engage with your popups. Of course, you will also need to provide something of value to a visitor. The trick is to determine an exact value proposition that a specific audience segment will care about—while also balancing the value your business receives from visitors who engage with the pop-up. Perhaps the easiest way to get your visitors’ attention is to present a message offering them a discount of some sort. 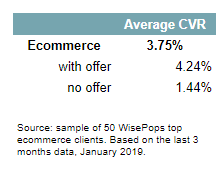 While any type of discount should help with motivating first time shoppers to provide their email address, according to our tests, coupons are THE most efficient way to convince your visitors to subscribe. (Source. By adding a $7 coupon, our client was able to capture four times more emails than without a discount). 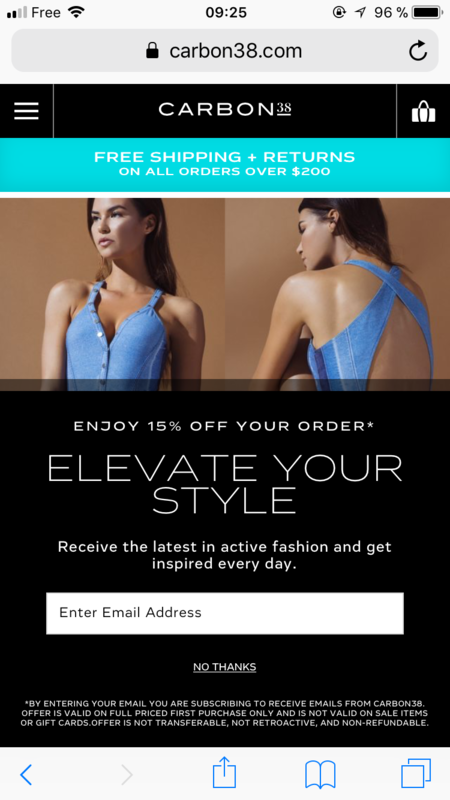 Note: While discounts typically allow businesses to capture more emails, they do come with a downside. 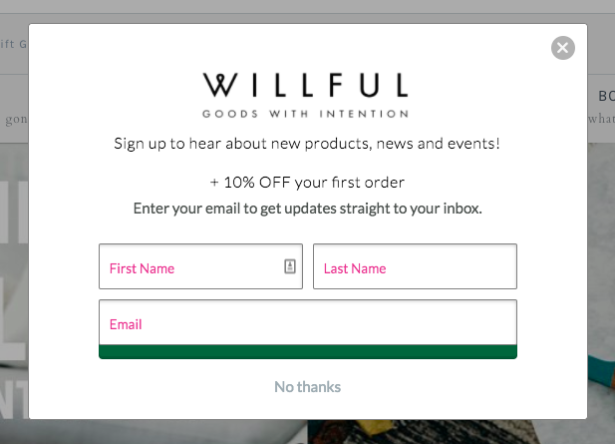 Not only is your store forced to discount merchandise, but you potentially will experience a higher unsubscribe rate as many of these shoppers only opted-in for the discount (making it even more important to have a stellar welcome series). 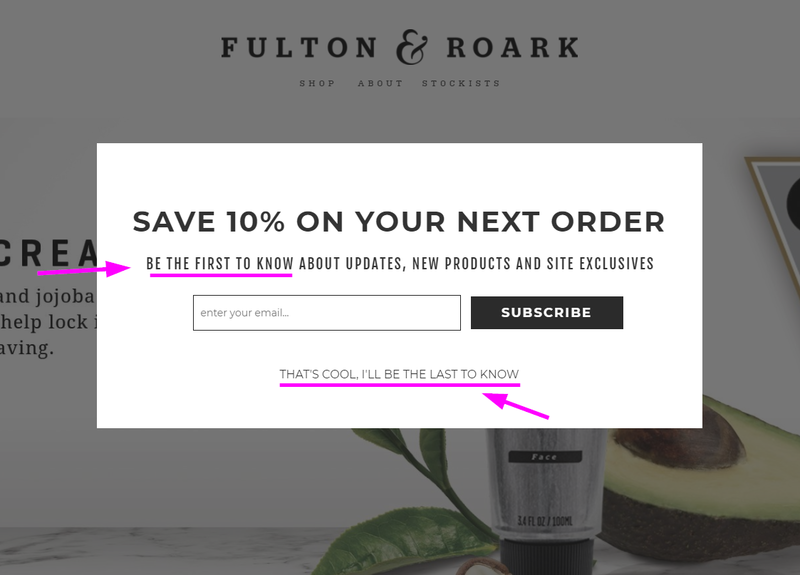 If you prefer to make coupons more exclusive, but still want to provide an incentive whose value is easily understood, you can try running a giveaway to get people to subscribe to your Shopify store’s newsletter. In most cases, giveaways are substantially more affordable than discounts while still being an extremely effective way of getting users to subscribe to your newsletter, especially when compared to providing no offer with your pop-up. (The above data comes from one of our clients, a major shoe retailer. They ran a pop-up campaign with no offer alongside a sweepstakes popup campaign and found the sweepstakes pop-ups to convert 4 times better than the pop-ups with no offer). As we mentioned, you don’t necessarily have to offer a discount or something of monetary value to get people to engage with your pop-up. Note: You might recall that in the beginning of this section we mentioned that pop-ups with an offer convert nearly three times better than those with no offer. However, providing no offer other than news related to your Shopify store can still be a valuable way of building your email list, While you’re more likely to deal with lower conversion rates as compared to providing some type of offer, you’re also more likely to build an engaged list as these subscribers really want to hear from you. Not sure what to offer as a way to get people to engage with your pop-ups? Remember, your marketing goals for a given pop-up must align with your strategy, as well as the intensity of your target’s relationship with your brand. No matter what the “next step” is for a specific target, you need to be sure the value you offer them is enough to get them to take it. The third piece of the puzzle is in getting the right offer in front of the right person at the exact right moment. Timing is perhaps the determining factor as to whether your visitors find your message incredibly valuable—or extremely frustrating. Timing is also the difference between whether or not your visitors even see your pop-up in the first place. If you schedule an overlay to appear at, say, the 30-second mark, those who don’t stay on-site for 30 seconds will never see it. Regarding the latter, we’re talking about events such as mouse movement, scrolling through a certain amount of the page, hovering over an image or link—and much more. To determine the exact optimal moment to present a pop-up to a given visitor in order to provide a valuable offer that’s relevant to the circumstances at hand. The optimal timing or trigger event for presenting pop-ups typically revolves around the interest and engagement levels of your average visitor. You want to determine the exact moment in which your visitors’ interest is either at peak or near-peak and in which they wouldn’t be bothered or distracted by an interruption. Generally speaking, this usually equates to around 50-60% of your visitors’ average Time On Page, or to the 50- or 60%-mark in terms of page scroll. It’s also worth mentioning the “tradeoff” that occurs naturally due to the timing of your pop-ups. On the one hand, your audience becomes smaller the longer you wait to display your pop-up, since not every visitor will stick around long enough to see it. On the other hand, since the longer-staying visitors are obviously more engaged than those who have already left your site, you have a better chance of getting them to convert. Now, there is an exception to the whole “interrupt without interrupting” rule, and it has to do with exit-intent pop-ups. See, the entire point of exit-intent pop-ups is to interrupt your visitor from completing the act of leaving your site in the first place. When your visitors either get closer to your full average Time On Page, or right as they take a specific action known to have exit intent (e.g., moving the mouse to the top right of the screen), you want to do whatever it takes to disrupt them. Otherwise, though, your goal is to use your popups to add to your visitor’s experience—not disrupt it. Okay, so we’ve already talked about how easy it is to think of what a really bad pop-up looks like. But now, the question becomes: What makes a really good popup? There’s also one very important aspect of your pop-up that often can mean the difference between converting and losing a visitor—which we’ll get to in a bit. Clarity, here, refers to both clarity of message and clarity of design. That is, the offer and ask of your pop-up must be obvious, and it must be equally obvious what your prospect is to do. In the above example, the offer of 15% off is crystal clear—as is the call to action. Additionally, the layout and design is rather sleek, matching Carbon38’s overall motif (more on this in a moment. If we were to have one negative thing to say about the above pop-up, it’s that it isn’t exactly brief. 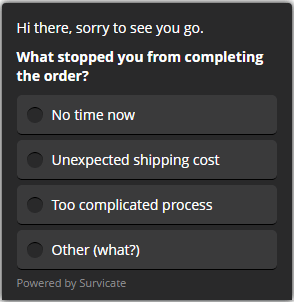 While more verbose copy in a pop-up can be effective, we’d advise you err on the side of brevity for the most part. Remember: Even if you’ve nailed down your timing, your pop-up will still probably interrupt your visitors at least somewhat. That said, you’ll want to use your pop-ups to briefly interject with a quick offer, then step aside to let your visitor continue as planned. The third key factor as to what makes a good pop-up is branding. As all your marketing content should be, your pop-ups should reflect the overall “feel” of your brand, both through its copy and visual appeal. One very important area pertaining to copy and design that’s worth paying extra attention to is the call to action of your pop-ups. Scroll back through each of the examples we’ve provided so far, looking specifically at the call to action button and copy. The majority of their CTAs all stand out in some way, be it color, font style, or copy. Of course, that’s no accident. You want your visitors to easily be able to find the call to action button. Additionally, you also want to use the button’s copy to keep them engaged and moving forward. That’s why your CTA should include copy that’s specific and actionable. Basically, your CTA’s copy should see things from your visitor’s perspective, and reiterate what’s in it for them. That way, they’ll be much more content with providing you with their contact info (or any other relatively minor thing you may ask for), knowing they’re receiving massive value from you in return. Essentially, your goal is to reinforce the value of your offer in such a way that your visitors would feel like they’re truly missing out on something special by not engaging with the pop-up in question. Just to reiterate, there’s no “one way” to go about designing your popups. While contrasting colors and a tongue-in-cheek copy may work for some brands, other companies may be successful with a more subtle and subdued approach. No matter which approach you decide to take, make sure you keep clarity, brevity, and branding at the front of your mind as you develop your next popup campaign. The modern consumer typically uses more than one device to fulfill their online shopping needs at a given moment in time. Studies show that more than half of all ecommerce-related traffic will come from mobile devices by 2021. In fact, during Black Friday, Cyber Monday 2018, mobile purchasing accounted for 66% of sales from Shopify merchants. Therefore, it’s essential that when creating Shopify popups, you not only take your desktop traffic into consideration, but your tablet and smartphone traffic as well. If your pop-up looks awful—or worse, if it doesn’t work correctly—on a specific device, you’re going to lose a pretty decent chunk of your audience. Not only that, but you can potentially be hit with a penalty from Google, too. Now, while many pop-up creation tools typically provide the option to make your pop-ups responsive, we’d advise taking things into your own hands and actually create multiple versions of the same pop-up, making sure each is optimized for a particular user’s browsing device. Reason being, “responsive” doesn’t necessarily mean “optimized.” In other words, simply going with the responsive option could lead to issues such as poor formatting, slow-to-load images, or an inability for your visitors to actually engage with your popups in the first place. Again, this will cause you to lose a ton of potential customers, a penalty from Google—or both. 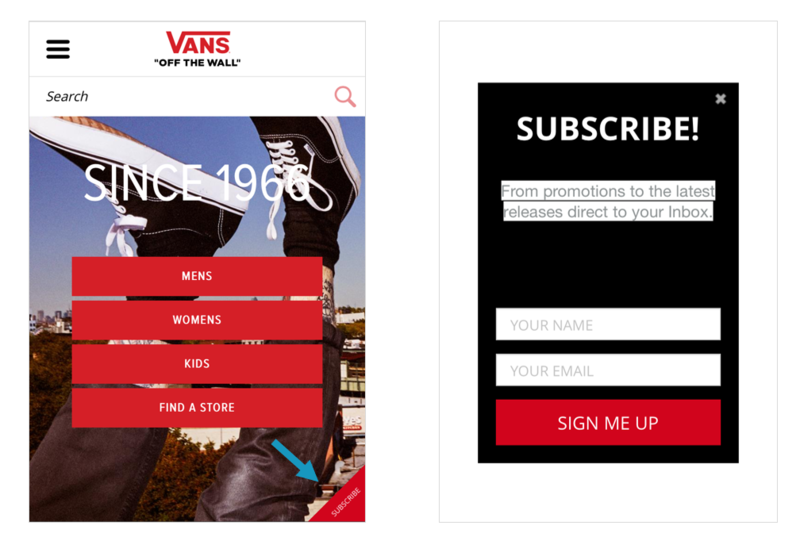 We’ve covered the best practices for creating mobile popups before, so let’s quickly go over some of the areas to focus on. First of all, your mobile popups should be as non-intrusive as possible. 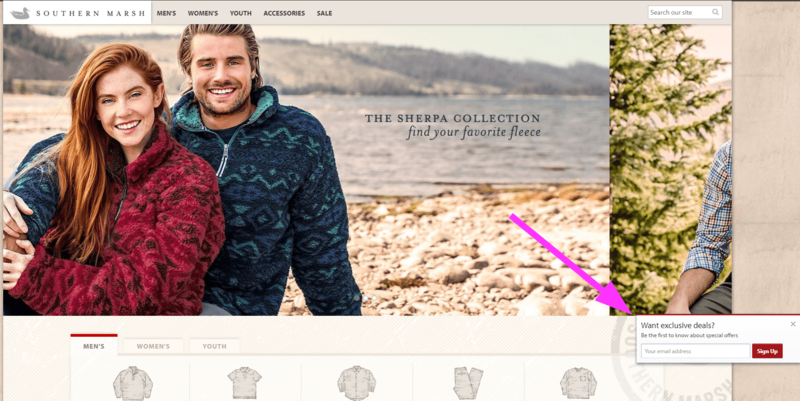 You could show a full-screen modal on the second page of a user’s journey with your Shopify store. While this would be compliant with Google’s guidelines, it could turn potential customers away due to poor UX. We recommend the banner to be full width and a height of 250px or less when using this option. The advantage of using a popup that appears at the bottom is that it’s compliant with Google and provides a relatively good user-experience in that it doesn’t block any content. The only potential issue is that the email field can be small making it difficult for users to subscribe. The advantage of this type of overlay is that it’s 100% SEO compliant as well as being user-friendly since it doesn’t interrupt the browsing experience. Now, as far as design and copy go, you’ll want to be even more clear and concise on mobile for two reasons. Mobile users have shorter attention spans. Desktop users viewed 40% more pages than smartphone users according to a report from Monetate’s latest mobile report. 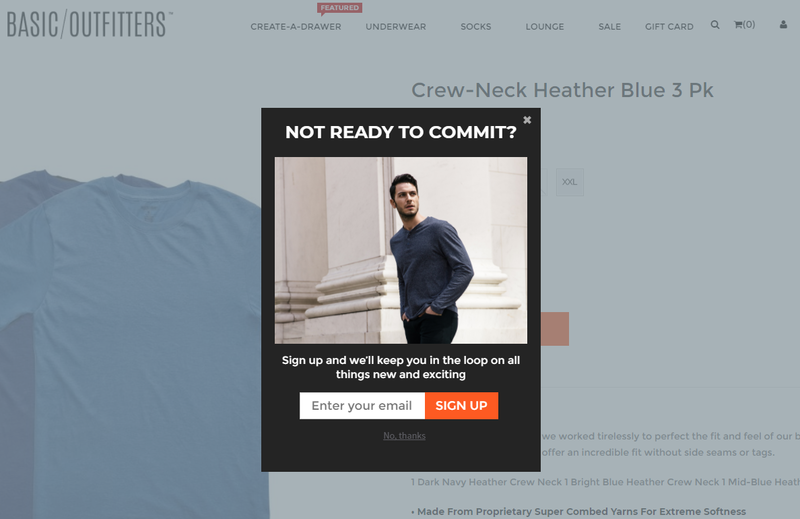 Take a look at the following popup that’s shown to shoppers that visit Carbon38’s Shopify store from their desktop. However, the “meat” of the pop-up—the offer, the copy, etc.—and the overall “feel” of the pop-up remain consistent between devices. All that’s changed is how its delivered to visitors using separate devices. 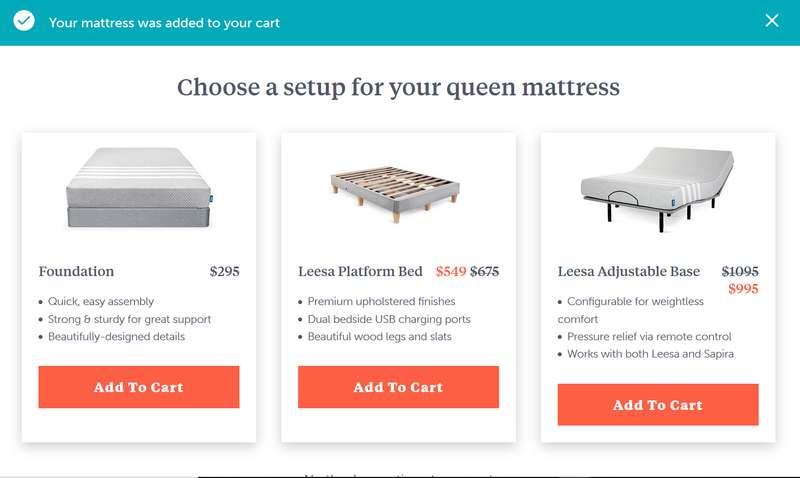 Now that we’ve shown you how to create and present your pop-ups as a means to enhance your visitor’s experience (rather than distract them from it), let’s go over a few use cases to show you how using pop-ups with your Shopify store can help with growing revenue. Get them to actively engage with your brand in at least one meaningful way. Typically, the first major step you want prospects to take is to sign up for your mailing list. 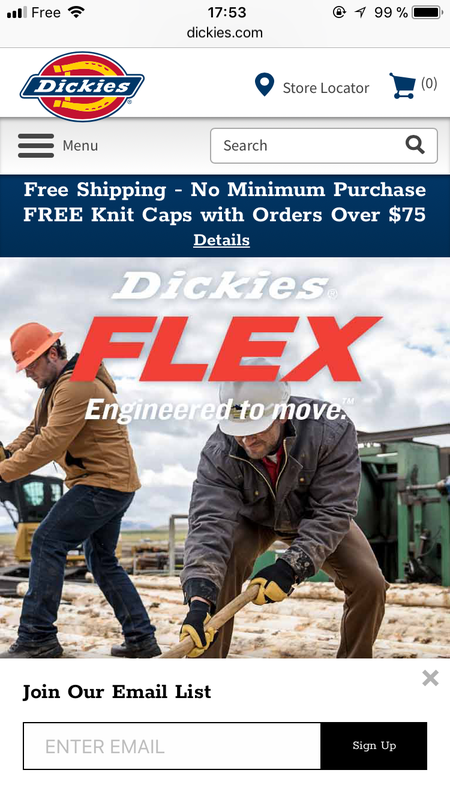 Because first-time visitors probably aren’t going to purchase something right off the bat, so you at least want to capture their email address. 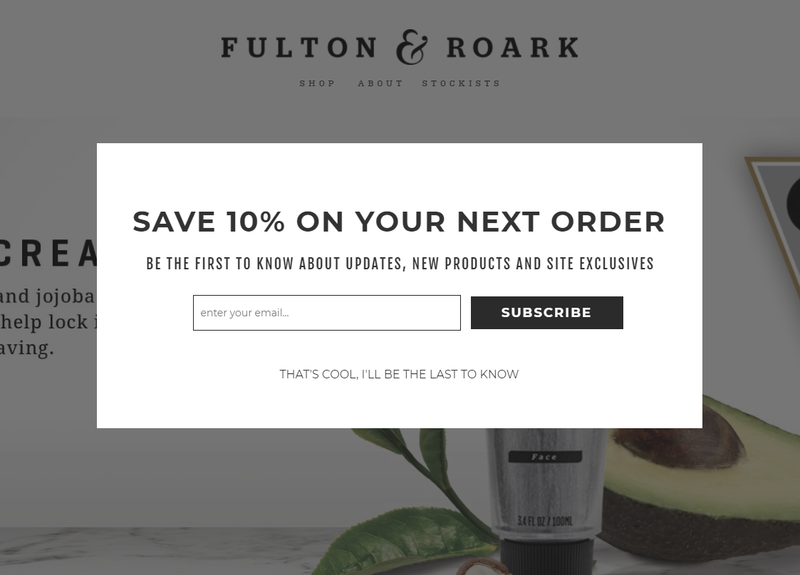 As you’ll see, there are a number of offers and types of pop-ups that you can use in order to try and convince people to subscribe to your newsletter. The unusual shape which resembles a lotus flower – while this may seem odd, it’s a shape that resonates with Gaiam’s target audience and therefore is more likely to catch their attention. The wording subtly suggests people might be missing out on something through the copy (‘Stay in the know’). 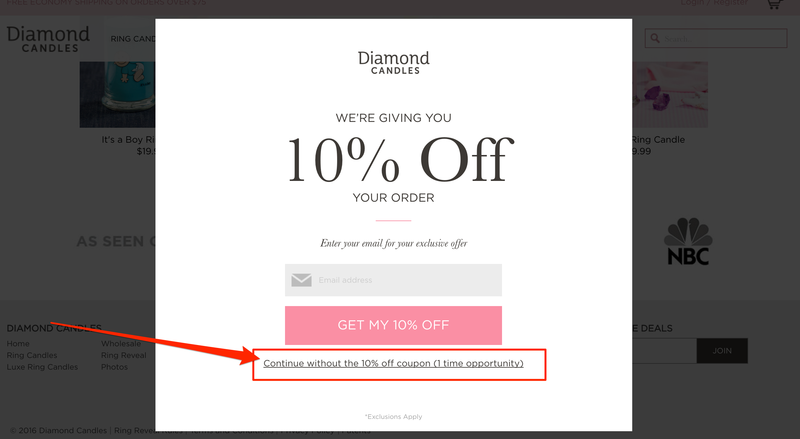 Diamond Candles tries to capture emails by using an exit-intent pop-up that’s shown to new visitors on their Shopify store. 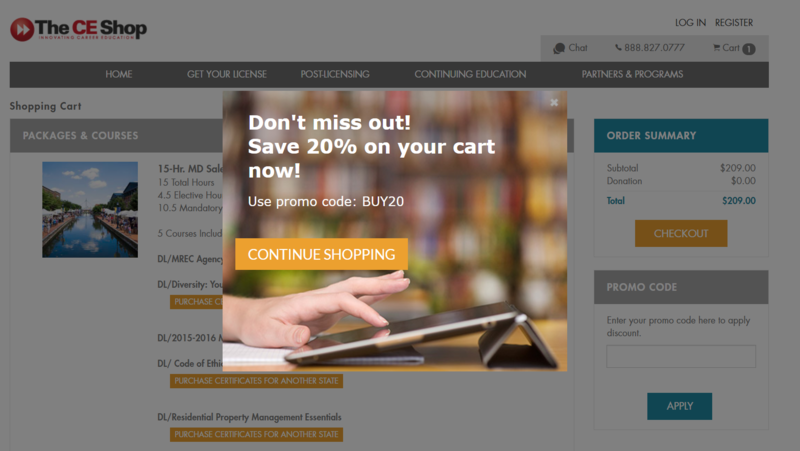 What makes this pop-up effective is that the company highlights that the offer of a 10% discount is a one time opportunity which creates a sense of urgency. The key to making this work is with proper segmentation as you want to stop displaying the message for every first-time visitor after the first showing. If you prefer to be less intrusive, you can use a notification bar with a CTA like Kate Somerville does in the example below. 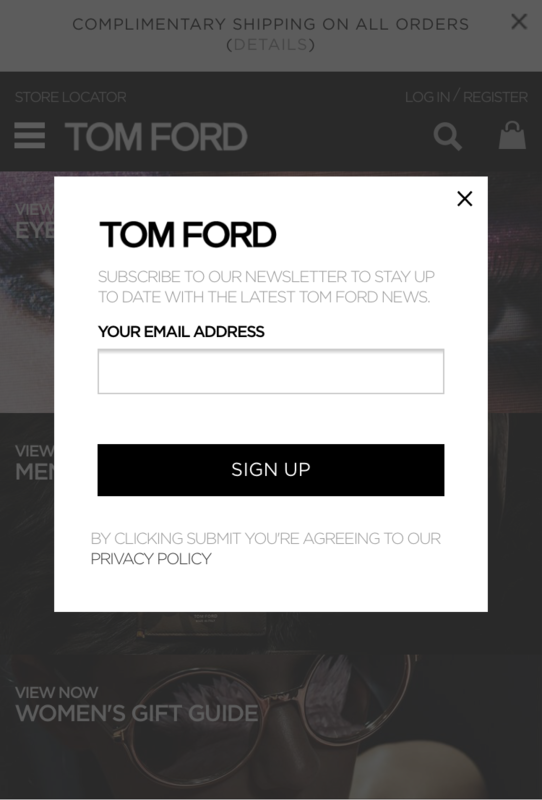 Clicking on the CTA brings up a pop-up with several offers in an effort to get people to subscribe to their email list. 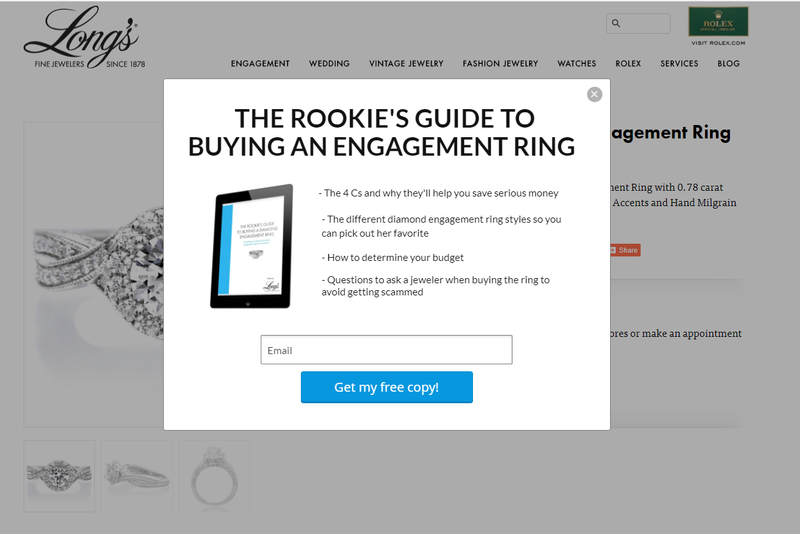 In addition to getting newcomers to engage further with your brand, you can also use pop-ups to reduce your cart abandonment rates. Exit-intent pop-ups are particularly useful for this situation due to the “pattern interrupt” technique. By interrupting a shopper’s intended action of leaving your site, you have the opportunity to make them more willing to give your store a second chance and ultimately make a purchase. However, if you want them to reconsider, it’s important to display the right message. Now, let’s take a look at a few examples of how to actually apply this. 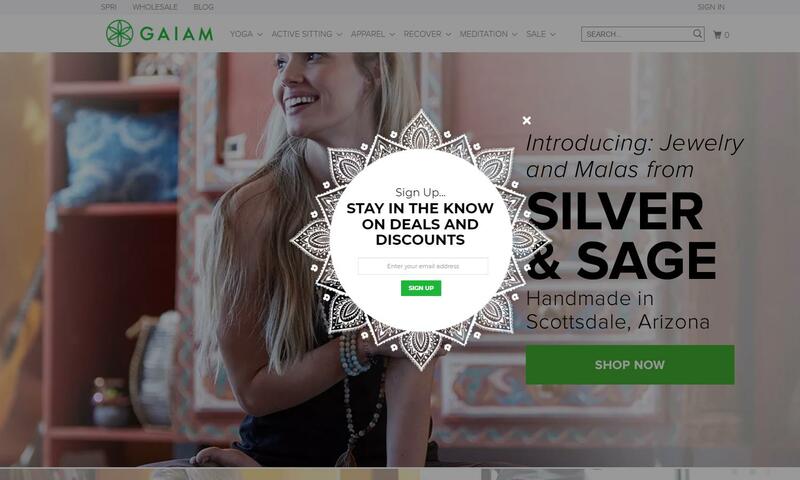 Gaiam uses an exit-intent to remind shopper’s of what they have in their cart. The effective use of copy, which plays on a shopper’s fear of missing out though persuasive tactics like urgency and scarcity, is what gets a shopper to think twice before leaving. 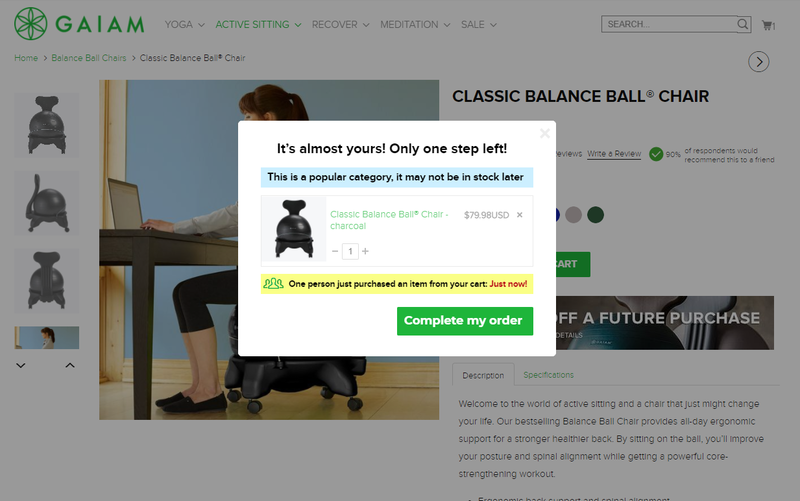 You’ll notice that Gaiam emphasizes the fact that the item in the user’s cart is from a popular category and might not be in stock later. Furthermore, Gaiam highlights that the item in question was just purchased, further creating a sense of urgency. Another example of an exit-intent pop-up comes from Leesa. In this case, shoppers are presented with a limited time-based discount which creates a sense of urgency that potentially triggers loss aversion for shoppers. Between the new discounted price and the tendency for people to want to avert future loses, a shopper may be more motivated to continue with their purchase. 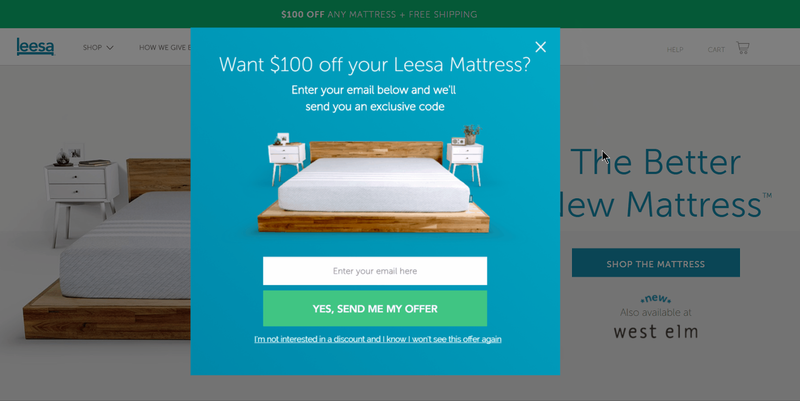 Because shoppers need to enter an email address to unlock the discount, Leesa potentially has a second opportunity to recover a cart abandoner… this time through email. Popups can be an incredibly effective method for increasing the amount of money your customers spend in a single transaction. One simple way of increasing your AOV is by getting customers to spend a minimum amount which can be done by offering incentives like free shipping, a free gift, or a coupon to users that meet or surpass your minimum order amount. 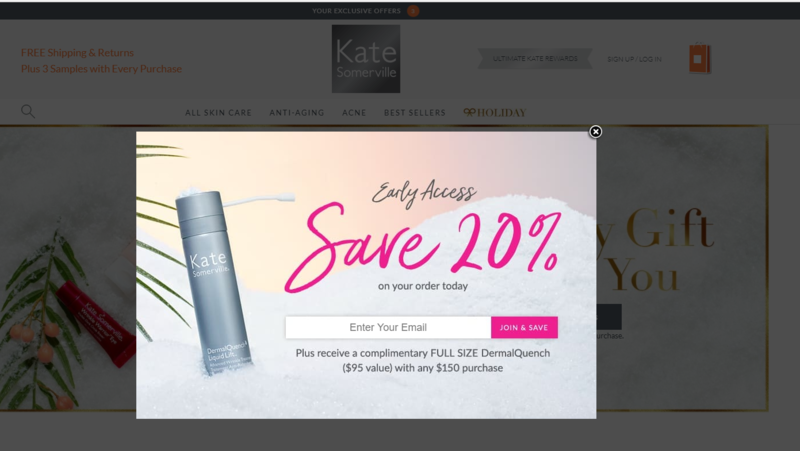 Kate Somerville uses a pop-up to offer a complimentary gift valued at $95 when shoppers spend $150 or more. The key to being effective with popups that are meant to cross-sell or upsell your customer is to show items that provide additional value to the specific customer in question. Finally, you might decide to use a pop-up to learn more about your visitors, as well as their experience thus far with your brand. In the example below from Fabletics, the company provides a quick survey (note the progress bar) to current customers regarding their athletic interests. In turn, the company can then provide even more precise content (whether via pop-up or email) to these individuals. Hopefully, by this point, you’re no longer on the fence with regard to the use of popups within your Shopify store—and you now understand just how powerful of a marketing tool they can be. Still, it is worth keeping at the front of your mind the idea that most consumers’ knee-jerk reaction to seeing a popup is to be annoyed and/or frustrated. This is why it’s so important to design your popups in such a way that, when they do appear to your target audience, they come as less of an annoyance, and more as a pleasant surprise.